Gairloch, nestling on a bay overlooking the Minch and surrounded by mountains and moorland, lochs and beaches, wide open spaces and breathtaking sunsets. Wester Ross has some of the most spectacular scenery in the Highlands. Home of the red deer and the golden eagle, the area is rich in other bird life, wildlife and marine creatures, including the Minke whale. The beautiful Loch Maree, with its island based Viking graves, is some fourteen miles long and one of the prettiest lochs in the Highlands, is just a short drive from Gairloch. The spectacular mountains in the Torridon area, including the Munro's Beinn Alligan, Beinn Eighe and Liathach offer excellent climbing, and there are many easier beautiful scenic walks for those who like a more leisurely pace. Experienced guides are available who also offer supervised rock climbing and abseiling. Deer and eagles can often be seen on these walks, and occasionally, the more elusive Pine Marten. The Gairloch area is the ideal base for touring Wester Ross & exploring the Beinn Eighe Reserve, Britain's oldest National Nature Reserve, established over 50 years ago to protect and preserve the ancient pine woods where the red deer roam freely. The Beinn Eighe range includes 6 Munro's ( mountians over 3,000 ft). The highest point is Ruadh-stac Mor, at approx 3,313 ft.
Scotland Mountains - there is nothing better. The area is a fisherman’s (and woman’s!) paradise, with salmon, sea trout, brown trout and coarse fishing available. The port of Ullapool, approx 1 and a half hours drive, has daily ferry sailings (weather permitting) to Stornaway on the Isle of Lewis. Coach trips are available visiting black houses and the amazing Callanish Stones. Poolewe, some ten minutes drive from Gairloch, is situated at the mouth of the River Ewe and opens out onto Loch Ewe. A short drive, through Inverasdale, Naast and Midtown and past the incredible Firemore beach, the road ends in the tiny hamlet of Cove, where at Rubha nan Sasan is a war memorial to the lost crews on Russian Convoys. The remains of the gun emplacements can still be seen. 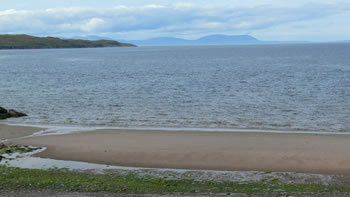 We have 3 cottages in the Gairloch area. 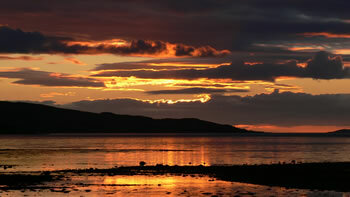 Book your holiday in Wester Ross. Contact Frank and Dianne Buckley by phone 07901 817 608 or e-mail for prices and available dates. Sleeps up to 4 people in 1 king size & 2 twin bedrooms. A very comfortable property with views over the sea. Visit the website for more details of this self-catering cottage. Fernbank self-catering cottage at Melvaig has all ground floor accommodation throughout, is fully double glazed and warmed by central heating. There is a ramp access and wide doorways to accommodate wheelchair users. Bookings now being taken for summer. Also Autumn, Winter and Spring breaks offer excellent value - take a break from the city and reduce your stress levels and have the beaches and golf course to yourself. Framed by the majestic mountains, Gairloch’s golden beach overlooks the sparkling waters of Loch Gairloch. Harbour porpoise can often be seen in the summertime, together with the seals that follow the fishing boats. Whale-watching and marine life trips are a must. 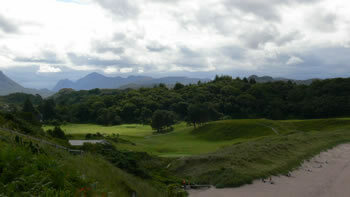 The golf course, sitting just behind the beach, and which is open to visitors, offers stunning views towards Torridon. The Gairloch Golf Course is open to visitors. The view from the golf course is outstanding looking towards Torridon. The golf course is open to the public for snacks and light meals. The islands of Skye, Harris & Lewis sit on the horizon, and on a clear day, North Uist is just visible, peeping around the north tip of Skye. Trips to the uninhabited Shiant Islands, home to a wide variety of sea birds, including the puffin, are available via local boats. Gairloch has magnificent views over the Isle of Skye. There are various marine life trips around the bay and further out to sea including to the Shiant Islands. 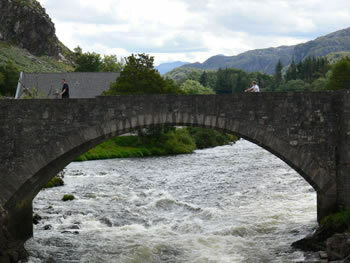 Boats are available for hire, and salmon, brown trout and sea trout fishing can be arranged. Poolewe is a short drive from Gairloch and the area around Loch Ewe is full of wildlife including otters. 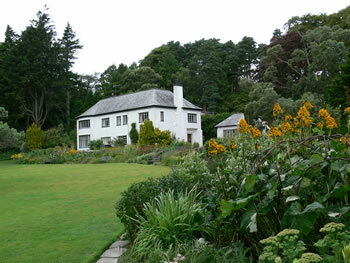 Located in Poolewe, you will find the world- famous Inverewe Gardens, a National Trust Site. This exceptional semi-tropical garden was built over 130 years ago and is a tribute to the work and vision of Osgood Mackenzie. Gairloch is a community connected by a number of small hamlets, all with their orginal Gaelic names, and the scenery alternates between beautiful mountains and valleys, views over lochs, and of course the Hebridean islands. 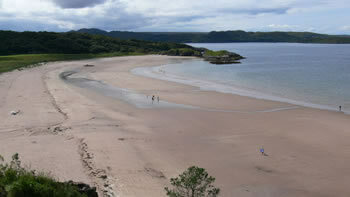 Visit Gairloch and Wester Ross and see why so many other people do.